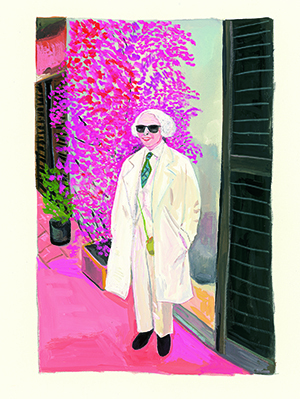 ‘Sara Berman on the Terrace in Rome with Bougainvillea’ © Maira Kalman. Courtesy Julie Saul Gallery, New York, NY. That independence and a sense of joy in small moments of beauty can be attained at any time of life are among the many lessons of the exhibit “Sara Berman’s Closet,” at the Skirball Cultural Center in Los Angeles through March 10 and then moving to the National Museum of American Jewish History in Philadelphia, April 5 to September 1. Berman, mother of Israeli-born illustrator-author Maira Kalman, made a sudden, late-in-life decision to leave an unhappy marriage and move from Tel Aviv to a small apartment in New York City. Through her lush paintings of Berman’s life as well as clothing and other objects from her mother’s closet, Kalman and her son, curator-artist Alex Kalman, create a loving ode to family, choices and unexpected voyages.